Take Action: Speak up for pigs! This option for commenting only on the sow stall portion of the Code. The new Code will allow producers to confine sows in stalls for up to 35 days (5 weeks) of each breeding cycle. Combined with the 2 to 3 weeks they spend with their piglets in farrowing crates, this could amount to over a third of each reproduction cycle spent in a cage where the mother pig can't turn around. With proper management this confinement is unnecessary, and is detrimental to the sow’s health and well-being. The Code also allows producers to continue to use stalls as they are now — for full gestation confinement — until July 1, 2024. For new renovations or facilities, the phase-out deadline is 2014.
a) Go to the NFACC website and click on the red square titled "Click here to participate in the pig code of practice public comment period." b) Complete the first page/screen of the online form, where you’ll be asked for your name and email address, whether you’re submitting on a behalf of an organization, and your perspective — i.e. “animal welfare advocate”. c) Go to sections 1.1.2, 1.1.3 and 1.1.4 and state that sow stall confinement is unnecessary for any length of time, and that 2024 is too long to wait for the new Code to take effect. Mention that NFACC's own scientific report shows there is no need to lock up breeding pigs for this length of time, and that the stalls are banned altogether in several European Union countries. Canada should be striving for these same high standards — not including a loophole that allows confinement to continue, especially when a growing number of Canadian restaurants, grocery retailers and consumers are demanding it be phased out. d) Move through the remaining sections (for those you don’t wish to comment on, simply click “No comments on section above”). On the final page (there are 9 pages in total) you’ll see a box titled “Concluding Comments” where you can provide general feedback if you wish. Then click “Done”. This option is for more in-depth comments on the Code. In addition to sow stall confinement, there are several other significant welfare issues in the new Pig Code, such as the need for straw, transportation of pigs, tusk trimming/boar bashing, and Code enforcement. To see our brief overview of each of these issues and the relevant sections on the NFACC comments form, click here. Or, to go directly to the NFACC website and begin providing your feedback, click here. Please note that all comments on the Pig Code must be made using the online comment form.Whatever your method of feedback, your input is important! Organizations like the Canadian Pork Council (CPC) — which has not yet commented publicly on the Code — will provide comments, along with their members, in a bid to persuade the NFACC Pig Code committee to follow CPC’s views for the final Code, which is scheduled for release December 2013. Don't miss this opportunity to speak up for pigs! CCFA is inviting restaurants across Canada to sign a petition asking the National Farm Animal Care Council (NFACC) to eliminate sow stall confinement from the Pig Code — and so far, 100 restos have shown their support! By getting restaurants on-board as signatories for no stalls, the better the chances that stalls will be eliminated, and that a positive example will be set for other farm industries — especially egg-laying hens in battery cages — ultimately helping to create a larger pool of cage-free producers. NFACC has taken important steps in the new Pig Code to reduce stall confinement, but its own scientific research shows there’s no need to keep mother pigs in stalls for up to 5 weeks of each breeding cycle, as the new Code now allows. Moreover, stalls have been completely banned in several European countries. Why shouldn’t Canada strive for the same high standards? How you can help: Encourage your favourite restaurants to support better standards for farm animals. Mention it to a server or manager, and if they seem interested, ask them to send us a quick email. We’ll then add them to the list of restos that already support a no-stall Pig Code. Check in at www.humanefood.ca in the coming weeks for the complete list! The deadline for restaurants to comment is August 3rd. Maple Lodge Farms will learn the outcome this fall of an Ontario Superior Court case involving high numbers of broiler chickens and spent hens arriving dead at its processing facility in Norval, Ontario. The ruling had been expected June 28th but was postponed to give the presiding judge more time to prepare. The case is the result of 60 criminal charges laid by the Canadian Food Inspection Agency (CFIA). CFIA alleges that Maple Lodge Farms (MLF) allowed the birds to be transported inhumanely in cold weather, causing large numbers to die of exposure. The charges are a step up from the administrative monetary penalties (AMPs) typically received by MLF for non-compliance with CFIA regulations. The case raises serious questions about the ability to transport chickens humanely. Currently, while there is an industry-driven Code of Practice governing their welfare, their DOA rates — i.e. the numbers of birds that arrive dead on trucks at slaughter plants — are at levels that would be unacceptably high for other farm animals. The birds are often injured in the loading process, and once on the trucks, are stacked in crates many rows deep, making it impossible to access them until they’re unloaded at the other end. In cold weather, when the trucks are often wrapped in tarps, the birds on the outside can still freeze while those on the inside can suffocate. Poultry producers generally consider the deaths a part of doing business. Today, however, it is almost impossible for industrial broiler (chicken meat) farms to delay shipments. The birds’ lives are timed to the day, and feed is withdrawn several hours before loading on the trucks — with another flock of young birds waiting to replace the flock going to slaughter. Spent egg-laying hens, meanwhile, are often frail and featherless after living in battery cages. Once they leave the barn and are on the trucks, responsibility for the birds shifts from producer to processor. Stay tuned for the ruling; we’ll keep you posted. CCFA gets its veg on! 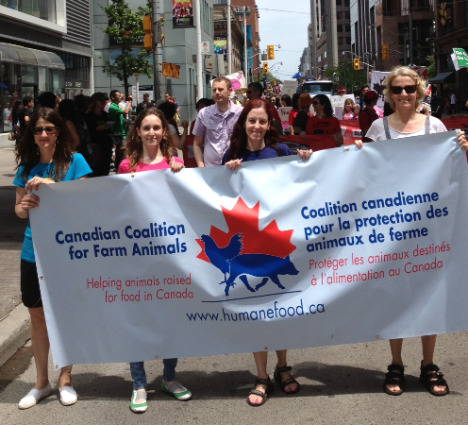 Toronto's annual Veggie Pride Parade took place June 1st and CCFA was out in force with many other groups, from Toronto Pig Save and Cedar Row Farm Sanctuary to Animal Justice Canada and the Toronto Vegetarian Association. It was great seeing so many people clearly passionate about plant-based eating and helping farm animals. The two go hand in hand! We’ll be taking part in the Holly’s Hope Walk for Ontario Farm Sanctuaries August 25th, plus some other events in the fall. Stay tuned for updates! This heart-warmin’, leg-swingin’ sandwich combines cozy melted vegan cheese with panko bread crumbs and nippy jalapeno. Pure heaven. Thank you PETA! Preheat the oven to 400°F. Place the jalapeno in a baking dish and roast for 15 minutes. Spread the vegan margarine on one side of each bread slice, then spread the vegan cream cheese on the opposite side. Top the cream cheese with the vegan cheese shreds and place each slice, margarine side down, on a heated frying pan. When the vegan cheese melts slightly, push the jalapeno slices into it. Then sprinkle bread crumbs over one slice, and top with the other slice so that the “inner cheese” comes together. Rotate as needed until both sides are golden brown and crispy. Yum. 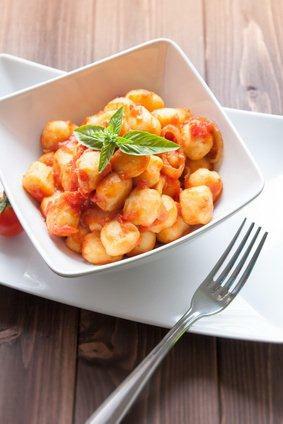 For more great veg cooking inspiration, see the recipes on our website! Copyright © 2013 The Canadian Coalition for Farm Animals. All rights reserved.